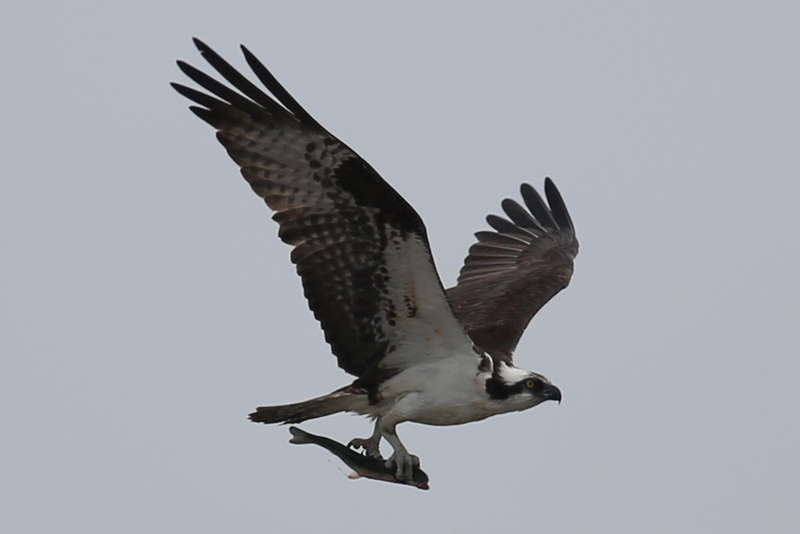 The keyword here is “properly.” I discovered that if I mount the camera and lens on a tripod or shoot at fast shutter speeds in bright light (fast shutter speeds are especially important if I’m shooting offhand, as I usually have to do when I’m photographing ospreys), this is a five-star lens. And when it’s mounted on my new Canon 5D Mark III, the focus speed is ridiculously fast, allowing me to catch some spectacula4r shots. 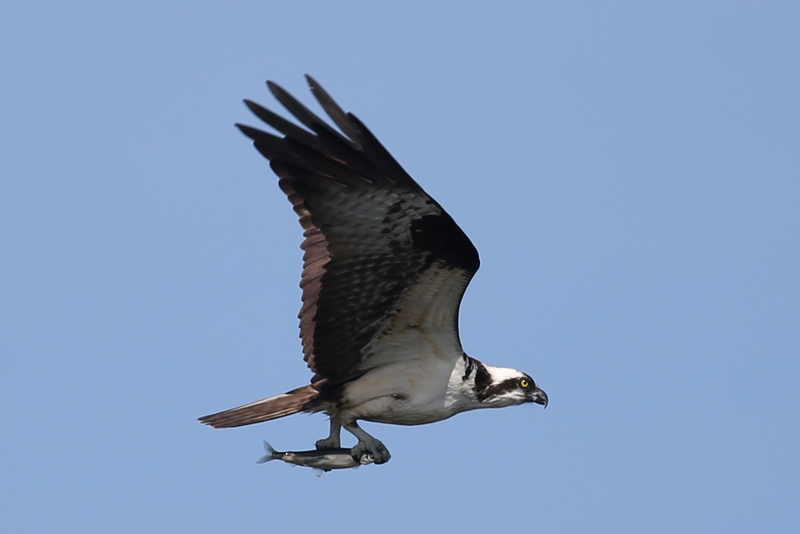 Lately, I’ve become all but obsessed with ospreys and I can often be found on the north or south jetties, at the mouth of the Rogue River, here on the border of Gold Beach and Wedderburn, Oregon, trying to photograph them while they pull fish out of the water. However, try as I might, I often either miss their dives or discover they’re too far off to get good photos of them plunging into the river. Still, I often get them as they fly up over the jetties winging their way home after a catch. So that’s what I’m presenting today: Ospreys carrying their catches out of the Rogue. 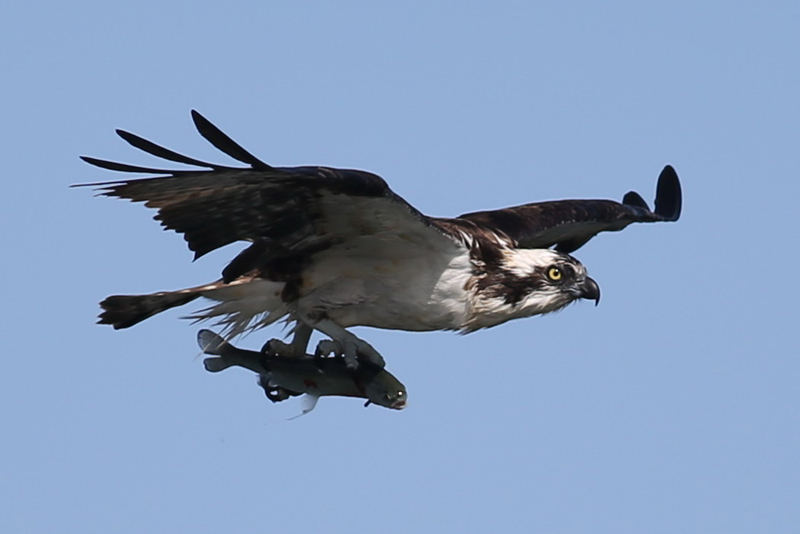 I should note that one of the things ospreys do, either from instinct or trial and error, is to orient the fish they are carrying so they are carrying them headfirst through the air, making them more aerodynamic as they fly. They’ll begin shifting the fish in their claws, to get them comfortably adjusted, soon after they get them out of the river. 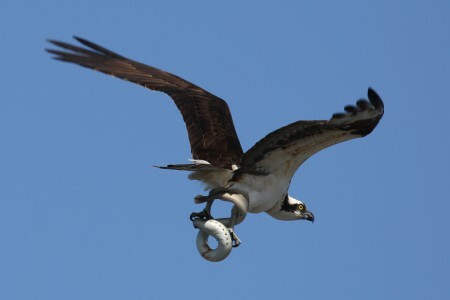 I’ve yet to see an osprey carrying a fish backwards. 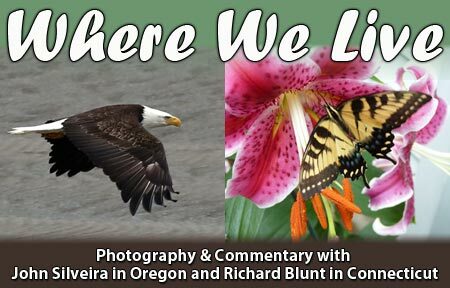 The four photos I’m posting, today, were shot using Canon 5D Mark III with a Canon EF 400mm f/5.6L USM lens mounted on it. I got a series of good photos of this guy as he flew along the south jetty of the Rogue, early in the morning. I don't know what kind of fish he's carrying. This is another example of an osprey carrying an unidentified fish headfirst through the air. This one had taken one of the many eels that swim into the mouth of the Rogue. When the eels coil around the bird's legs, aerodynamics goes out the window.